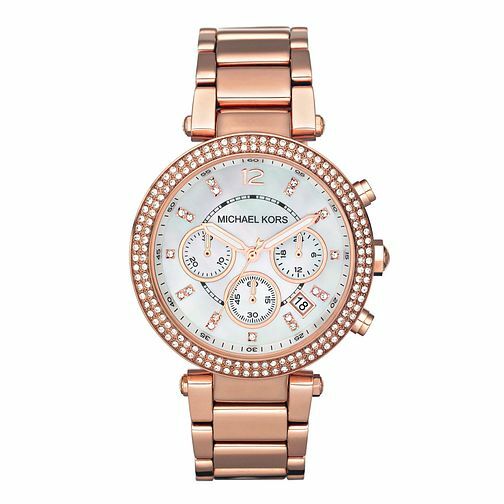 Michael Kors ladies' rose gold bracelet watch featuring round mother of pearl dial surrounded by stone set bezel. A stunning design that oozes luxury. Michael Kors Ladies' Rose Gold Bracelet Watch is rated 5.0 out of 5 by 4. Rated 5 out of 5 by Anonymous from Great features I was very impressed with my order I had before Christmas, I ordered a Micheal Kors watch for my mum as a preasent and my father was also impressed with his order so he also ordered off you as well. Rated 5 out of 5 by Anonymous from Michael Kors Ladies Rose Gold Watch Purchased this watch for my Daughter for her birthday. She loved it. Good quality and Style. She has found it easy to use and would recommend.